Things continue to go well with my running now that I finally seem to have the injuries behind me. The month of July I ran 140 miles which is the highest monthly total since April 2008 Prior to that I had been close to 200 a month for several years. It was a long recovery and healing process but once I accepted that I was injured and needed to get it fixed things went much better. I am so thankful to God just to be able to run and to have a strong healthy body. There are so many that will never be able to experience the feelings I have out there on the roads and trails. Once I decided to seek help things began to improve slowly but surely. Two people in particular were of great help to me in getting back on track. 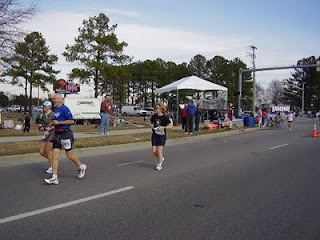 First was my massage therapist, Jay Sutton owner of AMR Therapeutic Massage in Cary. Frank and Karla had given me a gift certificate a year before but I didn't go back until I was having some Plantar Fasciitis pain. Jay was able to cure that in about 3 sessions and it has never returned. One of my biggest problems with the most recent injuries were in my periformis. Again that was fixed in just a few sessions also. The hamstrings took a lot longer simply because I had to finally just take off for a while to let them heal. Thanks Jay ! Also I began to see a chiropractor, Mark Jenson of Corrective Chiropratic in Raleigh. Mark was able to help get my lower back and neck alignment fixed which has also contributed my my overall well-being. If anyone needs either of these types of services I can recommend both.